La La Land will be engulfed in football fever on Sunday when the Chargers and Rams go toe-to-toe in a big NFL betting bonanza. The Rams are undefeated and in ESPN’s latest Power Rankings they are number one the list. However, they have a tall task in this game facing Phillip Rivers and a dangerous Chargers offense that can light up the scoreboard. The Chargers evened their record at 1-1 in their last game, beating the Buffalo Bills 31-20. They had more yards, picked off two passes, and they defended the run well. They’ll have to repeat that performance to beat the Rams. The Rams moved to 2-0 on the young season with a more-than-convincing 34-0 win over the Arizona Cardinals. The Rams have outscored their two opponents 77-13 and in their last game they dominated the Cardinals, recording 432 yards to 137 yards. The Rams have the talent on both sides of the ball and their defense will be key in this game, as you can be sure Rivers will air it out early and often. On the season the Chargers are 1-1 ATS and they have an Over/Under record of 2-0 and the Rams are 2-0 ATS with an Over/Under record of 0-2. 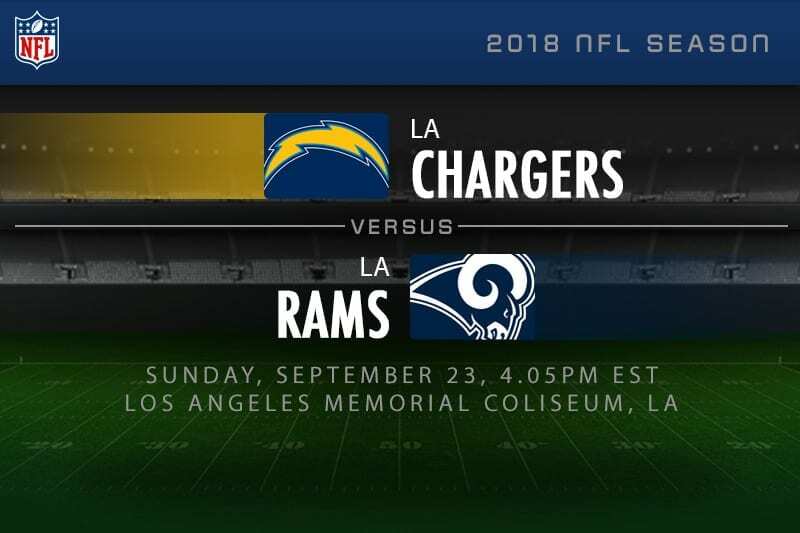 The last time these teams met it was in 2014 where the Chargers best the Rams 27-24. In their last game the Chargers beat the Buffalo Bills 31-20 where they forced the game’s only two turnovers and help the Bills to less than 300 total yards. Rivers passed for 256 yards with three touchdowns and no interceptions and he spread the wealth with four players with at least 38 receiving yards. Austin Ekeler led the Bolts with 77 rushing yards and Melvin Gordon, who rushed for over 1,000 yards last season, had a quite game with only 28 yards on the ground. Rivers and company will be facing a Rams’ defense that has been balanced ranking sixth in the league against the pass and fifth against the run. The Rams are coming off a 34-0 win over the Arizona Cardinals where the dominated every facet of the game. They were up 19-0 at the half and they held Arizona to only 83 passing yards and 54 rushing yards. Jared Goff passed for 354 yards with a touchdown and an interception and Brandin Cooks led the team with 159 receiving yards. The Rams have reigning Offensive Player of the Year Toddy Gurley in the backfield and in the win over Arizona he only rushed for 42 yards averaging a less than stellar 2.2 yards per carry. If the Chargers can keep him in check and force Goff to beat them with his arm they have a chance to win, as they cannot allow the Rams to rack up the rushing yards. Not much home field advantage in this game for the Rams, who share the same venue with the Rams. Rivers is still a legit quarterback that can light it up and I think he will have a big game. The Bolts may not get the win, but they will, at least, cover the spread in what will be a close game.